Thank you Jo NY for testing the pattern and providing the photo. Snood maybe worn low as in the photo or high across like a headband. The length of the elastic or ribbon should be adjusted accordingly. 1. Read pattern all the way through before beginning snood. 2. DO NOT use South Maid thread, it is too stiff for this project. Weave elastic or ribbon through the spaces of round 18. 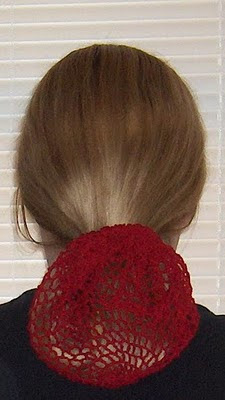 If using elastic, adjust to fit head, overlap the ends and sew in place. If using ribbon adjust to fit head and tie a bow. Hi Suzie, What is the lengtht of this snood? I am looking to make one for my daughter's wedding and want it to be like a 40's or 50's style. Is the length of the 18 rows long enough? Thank you for your pattern. I'm sorry I don't remember how large it is, but it can be worn higher on the head like a 40s style snood. If you need help with instructions for a few more rounds let me know. I know this is an old post, but am I correct in assuming that if I need this to be bigger, I would just continue as in previous rounds before working round 18, so that each repeat would be *ch 3, tr in next space, x+1 times, ch 3, tr, ch 3, tr in next sp*? Please add a pintrest option!